A recent poll revealed the biggest challenge standing between most men and being in a relationship with the girl of their dreams is the fact they will never even ask her out. Crazy, isn’t it? Men charge into burning buildings, take on natural disasters head on, risk their lives at war without thinking twice about it, yet a pretty girl walks into the room and they go into a shell, unable to speak or approach her. The fear of rejection is very real, and it still remains one of the biggest fears for many men. Some guys are so afraid of being rejected they would rather swim in a pool of sharks rather than ask a beautiful woman out on a date. So the question becomes: what are men so afraid of? And what can be done to reduce the agonizing fear that keeps men from approaching and talking to women they are deeply interested in. These are great questions and the answers may vary depending on who you ask. 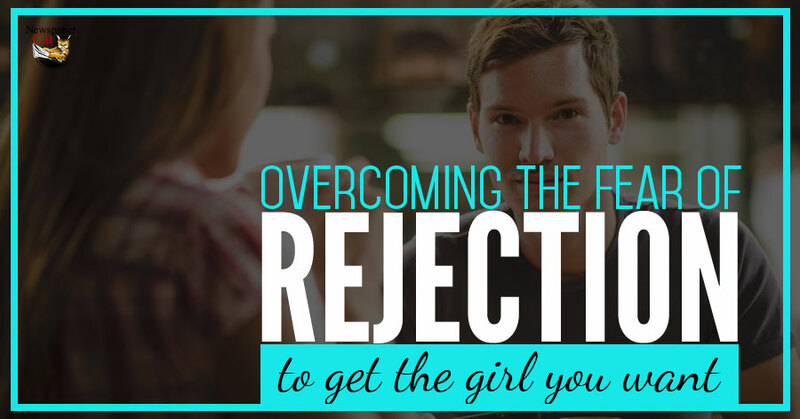 Based on my research and personal experiences, I have learned a great deal about rejection, and I’d like to offer up 4 tips that will help you overcome the fear of rejection to get the girl you want. By definition, the fear of rejection is the fear that someone will not accept you for one reason or another. As human beings, we have a natural longing to be loved and accepted. If there is even the slightest chance our heart may be broken by someone we care about (or by someone we are attracted to), we tend to put up a wall and avoid it at all costs. And that makes perfect sense. It hurts to get put down by someone. It’s humiliating to build up the courage to ask a beautiful woman out only to have her say no when you ask her on a date. Take a second to think about what is keeping you from asking your crush out on a date. Is the reason you wrote down really bad enough to keep you from trying? Are you mainly concerned she will say no or completely ignore you? Sure, on a not so great day you may run into a woman that acts distant or completely ignores you when you make an attempt to talk to her. You might run into one who is rude or flat out mean about it. However, those are the rare exceptions. Research shows that 95% of the time she will either accept your invitation or politely turn you down and thank you for asking. Also remember that approaching a woman is like giving her a compliment. It says, “I like you, and I want to get to know more about you.” Women go to great lengths to look beautiful, so when a man takes notice and approaches a woman, it gives her a confidence boost. It gives her confirmation that she’s attractive and desirable to men. Think about how you feel when a woman walks by, makes eye contact, and smiles. Or when she comes over to talk to you. It makes you feel pretty great, doesn’t it? Women experience that same feeling when men approach them. As long as you’re nice, not overly aggressive, and don’t do something weird or creepy to make her uncomfortable, it’s going to make her feel good that a man noticed her, even if she’s already in a relationship. Focus on having a positive interaction rather than pressuring yourself to get a date. After all, it’s human nature to want to feel liked, noticed, accepted, and that we matter. Cognitively based therapists can help identify your deeper, more concerning fears of rejection that may be directly related to physical appearance or negative thoughts about yourself. Cognitively based therapy aims to replace your negative thoughts with more positive and realistic thinking. An example would be retraining your brain to understand rejection does not mean you are unlovable or undesirable. It doesn’t mean there’s something wrong with you. It’s not personal even though I understand it feels VERY personal when it happens. It’s much easier to get over the fear or rejection when you understand the timing might just not be right or maybe you and her just aren’t a good fit, rather than looking at it like you’re a horrible person who doesn’t deserve to be loved. I understand most men don’t like seeking help. Most men don’t like therapists. I’ve always been that way too. But remember, getting help with women and getting help to overcome the fear of rejection doesn’t make you less of a man. The good news is if talking to a therapist makes you feel uncomfortable, there’s tons of help available online. I’d recommend downloading these free chapters from the Social Man first. I can’t tell you how much they’ve helped me over the past couple of years. I am sure you have heard the saying, “don’t judge a book by its cover.” The same concept applies here. Don’t assume girls are all the same or put women with a particular body type, hair color or nationality into a specific category based on previous experiences. Don’t assume that just because you approached a girl at a bar and she turned you down that every girl at the bar will turn you down. The next girl you ask out could end up being your soul mate, so be positive and keep asking. It’s a numbers game. The more you approach and the more you practice, the more comfortable you’ll get with it. Grow more comfortable with women just by smiling at them on the street or saying hi when you pass a cute girl in the aisle at the supermarket. You might just be surprised how she responds. Have you ever seen an unattractive guy dating the “hot girl” and you wonder how in the world he was able to convince her to date him? What’s his secret? It’s all about confidence. Believe it or not, getting the girl of your dreams starts with building an emotional connection. It’s all about attraction, and that attraction has little to do with how you look. Nothing is sexier to a woman than a man who has confidence and believes in himself. One of the best ways to replace your fear of rejection is to be confident. As your confidence builds, you will become less worried about rejection. It won’t hurt as much and it just won’t matter anymore because you’ll be right on to asking the next girl out. Overcoming your fear of rejection is never easy. It’s not an overnight process. I’ve struggled with shyness and social anxiety around women most of my life. So I know exactly what that feels like. Luckily I took a chance and downloaded the free shyness and social anxiety chapter found here, and I’ve never looked back. Language Of Desire Review – Is Felicity Keith’s Dirty Talk Program A Good Purchase?